Pledges to cut greenhouse gas emissions poured in yesterday from across the globe as countries from Korea to Iceland vowed new contributions toward what many hope will be the first truly international climate change accord. China made the biggest splash with a formal declaration to the United Nations of a promise to stop its rise in annual carbon pollution by 2030. The government also said it will slash its emissions per unit of gross domestic product by 60 to 65 percent below 2005 levels and boost non-fossil-fuel energy sources -- including both renewables and nuclear -- to 20 percent. Visiting Brazilian President Dilma Rousseff, meanwhile, struck a deal with President Obama in Washington, D.C., for both Brazil and the United States to increase their shares of renewable energy to 20 percent by 2030. Rousseff also promised to eliminate illegal deforestation in Brazil, while restoring or reforesting 12 million hectares (30 million acres) by 2030. Republicans dismissed those and other promises as unrealistic and irrelevant. Many climate advocates, meanwhile, complained that the pledges are not ambitious enough. But with a new global deal expected to be signed in Paris in December, analysts agreed that momentum is building toward a broad -- if to some insufficiently deep -- agreement. 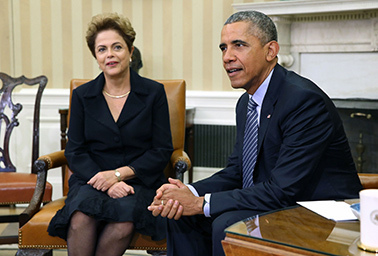 President Obama and Brazilian President Dilma Rousseff in the Oval Office yesterday. Photo courtesy of AP Images. "With China, Korea and now Brazil making concrete post-2020 commitments, we are now at more than 70 percent of global emissions being represented," said Brian Deese, a senior adviser to President Obama. Also yesterday, Korea announced it will cut emissions 37 percent from business-as-usual levels by 2030 -- a more aggressive cut than it had been considering, though the government said it will get there using carbon credits. Iceland, reflecting the European Union's already-stated goal, said it will cut emissions 40 percent by 2030 below 1990 levels, and Serbia vowed to slash its emissions 9.8 percent by that same year. The submissions bring to 44 the number of countries that have formally offered up plans to take action on climate change in the next decade. Harvard University economist Robert Stavins said he believes the Paris agreement will see pledges from countries representing almost 100 percent of the world's greenhouse gas emissions. That, he said, would be a momentous shift from the 1997 Kyoto Protocol, which demanded carbon cuts from nations representing just 14 percent of global emissions. "I view what happened today as an important step along the road to Paris, partly because of the importance of the specific countries and partly because of the nature of the process," he said. "The coverage is impressive and growing. And the scope of the foundation is what's key." George David Banks, executive vice president of the American Council for Capital Formation and a senior adviser on the international climate negotiations in the George W. Bush administration, said he agrees that more countries are starting to take on responsibility. But he said climate activists will need to accept the reality that the Paris deal won't be a sweeping environmental success. "When you stack [climate action] up against poverty eradication and universal access to electricity and what that means for economic growth, just looking at that landscape of where we think things will be in the next 20 to 30 years, there is no politically viable pathway for us to cut emissions globally the way that environmentalists advocate," Banks said. "No matter what happens in Paris, the environmentalists will spin it as being a huge success of climate mitigation. But if you're being very objective and looking at the numbers, what comes out of Paris will certainly blow the 2-degree target out of the water," he said, speaking of the goal of keeping global warming to less than 2 degrees Celsius above preindustrial temperatures. Indeed, the two most notable pledges -- from China and Brazil -- held few surprises and a number of disappointments for advocates of a strong climate deal. Paul Bledsoe, a former climate adviser in the Clinton White House, said of the China pact, "Frankly, I'm a little underwhelmed." He noted that models show China can actually peak its emissions as early as 2025 and said the government should have raised the bar for its emissions pledge instead of underpromising. "This matters because China is still the dominant determinant of a global emissions peak. Essentially, global emissions cannot peak until China's peak," he said. He called the pledge "worrisome," saying "it suggests that China may be back into the gamesmanship mode that they often revert to ahead of major negotiations." The Chinese plan calls for strengthening national and provincial laws, lowering coal consumption of electricity generation of new coal-plants to about 300 grams of coal equivalent per kilowatt-hour, expanding the share of natural gas to more than 10 percent by 2020, developing hydropower and nuclear, and enhancing "the clean use of coal." Not everyone was critical. Jennifer Morgan, director of the World Resources Institute's climate and energy program, said in a statement that China's new intensity target "demonstrates its intent to decarbonize its economy" and that the country has taken on ambitious clean energy policies. "Meeting this goal won't be easy, but research shows that with a sustained commitment, China can reach its target even before 2030. This commitment will benefit China and represents a serious and credible contribution to tackle climate change," she said. Meanwhile, many activists gave a withering assessment of Brazil's pledge, with Greenpeace Brazil slamming it as having "net-zero ambition" -- a play on calls for net-zero deforestation. The deal does not represent Brazil's formal intended nationally determined contribution, or INDC, which White House officials said will be submitted to the United Nations in the coming months, but rather is an early sign of what's to come. "It is not ambitious enough to ensure that Brazil will play a leading role," said Carlos Rittl, executive secretary of Brazil's Climate Observatory, a coalition of civil society organizations that have been pressing for a goal of eliminating all deforestation. Rittl noted that ending illegal deforestation is already an obligation under Brazilian law, and that counting biofuels, renewable energy already makes up about 29 percent of the country's energy. "It's not something really representing a shift," he said of the Rousseff-Obama agreement. "There's not much substance." Others criticized an agreement from the U.S. Department of Agriculture to begin the process of allowing beef imports from Brazil under conditions that reduce the risk of foot-and-mouth disease, the reason the ban was put in place in 2001. The deal includes no stipulation that Brazilian beef imports must be sustainably and legally sourced, something that environmentalists had pushed for because an estimated 60 percent of Brazil's forest losses are linked to cattle production. And while the White House announcement stated that Brazil "will pursue policies aimed at eliminating illegal deforestation," environmental groups were disappointed to see no specific targets for slowing or eliminating forest loss. "We were hoping for a little more than this," said Doug Boucher, director of the Union of Concerned Scientists' Tropical Forest and Climate Initiative. "We'll be looking for more in the INDC." The White House's Deese, though, called the Brazil agreement "ambitious," described the swath of land Brazil will reforest as being about the size of Pennsylvania and said the bilateral deal reflects the commitment of both Obama and Rousseff to seeing a strong agreement out of Paris. "This is a big deal for the United States. It will require tripling the amount of renewable energy on our electricity grid. For Brazil, it will require doubling," he said. "I think it reflects the commitment both countries have to driving renewables at the center of the clean energy transformation." Senate Republicans used the day of pledges to issue warnings about the Paris deal. Oklahoma Republican Sen. James Inhofe slammed China's pledge as "unattainable and unrealistic," arguing that China will "lure manufacturing and agriculture jobs away from the United States with the promise of affordable energy" as it continues to expand its emissions. Senate Majority Leader Mitch McConnell (R-Ky.), meanwhile, said countries considering inking a deal with Obama should beware. "Considering that two-thirds of the U.S. federal government hasn't even signed off on the Clean Power Plan and 13 states have already pledged to fight it, our international partners should proceed with caution before entering into a binding, unattainable deal," he said. Yet those with the most to lose -- like the leaders of small island nations worried that climate change will eradicate their homes -- said they are not deterred by U.S. political disputes. "All this internal politics of the United States, people putting out statements saying, 'Don't talk to them [the Obama administration]; they can't deliver,' I don't think that's helpful to anybody," said Marshall Islands Foreign Minister Tony de Brum. He said small island nations like his want to see all countries make more ambitious pledges but also believe they are seeing a groundswell of nations starting to take serious action. He said even his country -- responsible for such a small sliver of emissions that it barely registers on statistical maps -- is finalizing a plan to cut carbon. Meanwhile, de Brum said, he is cautiously optimistic that the Paris deal will be strong enough to save the Marshalls and other small island states from extinction. "Nobody wants to go to Paris and sign something that says the islands are going to go under," he said.